Hispanics will account for 33.5% of the under-18 population in 2060, growing from 24.4% last year to rival the non-Hispanic white population (35.6% share) in number, according to the latest projections from the US Census Bureau. Indeed, minorities’ share of the under-18 population will rise from 48% last year to 64.4% in 2060, per the study. 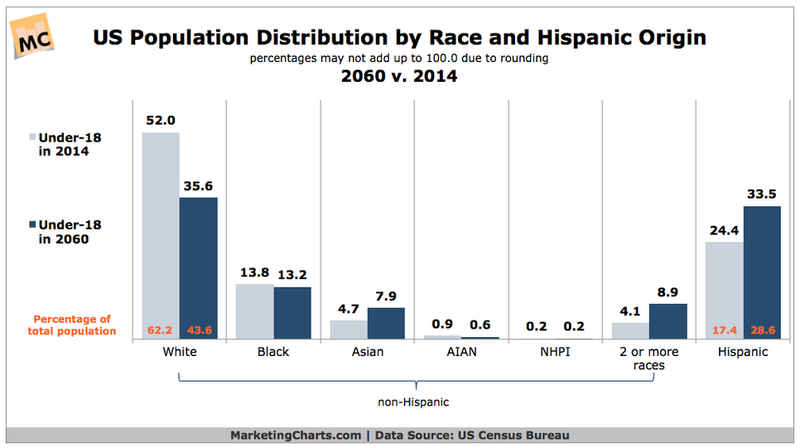 Meanwhile, as of last year, Hispanics comprised 17.4% of the total population, a figure that will rise to 28.6% by 2060. Asian-Americans are another fast-growing group, and are expected to increase from 5.2% share of the total population last year to 9.1% share in 2060.